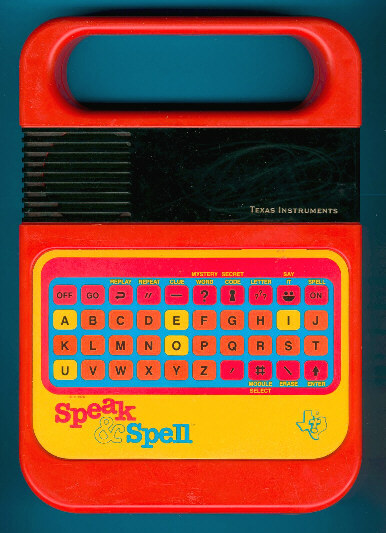 The speak & spell TI toy is far away the most used speech synthesizer. To expand its possibilities you can interface it to a computer or make some circuit-bending. You can try also the very rare Radio shack TRS-80 voice synthesizer (i bought one a few days ago and it sounds very vintage). Some software make the deal : the Analog-x say-it or the free naturalreader. There are also some interessing hardware : the TTS-03 TextSpeak Module, the humanware VoiceNote mPower QT, but far away the best seems to be the Magnevation Speakjet . 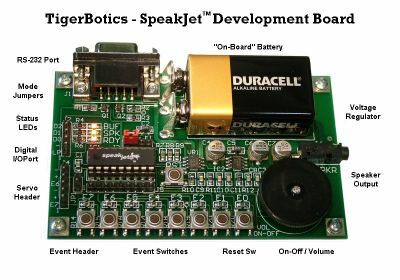 The SpeakJet is a completely self-contained, single-chip voice and complex sound synthesizer. It uses a mathematical sound algorithm to control an internal 5 channel sound synthesizer to generate "on- the-fly" unlimited-vocabulary speech synthesis and complex sound generation. The SpeakJet is programmed with 72 speech sound elements called allophones, 43 predefined sound effects and 12 DTMF touch Tones. Through the selection of these sounds and in combination with the control of the Pitch, Rate, Bend and Volume parameters, the user has the ability to produce unlimited phrases and sound effect with thousands of variations at any time. The SpeakJet can be controlled simultaneously by voltage changes on any one of its 8 input lines and by a single serial output line from a CPU. and a basicstamp CPU : The chip sounds very good with delicious robotic feeling. I am still looking to know how could I connect a computer to my S&S Texas Instrument. Anyone know of cheap mac software that will convert voice to text? ie: speak into a microphone output text. thanks 4 the links man, your sites cool.